While some fear a Muslim backlash after café killings, solidarity instead appears to be the order of the day. Ezdihar Malas was worried about catching the train to work this morning. The 29-year-old credit agent works in the heart of Sydney's financial district, not far from the Martin Place café where a gunman and two captives were killed on Monday night. The hostage-taker, Man Horan Monis, held 17 people for more than 16 hours and played on ISIL symbolism to make people believe his actions were terrorism related. As it happened, the image of a black-and-white flag with the Islamic shahadah, or declaration of faith, that Monis forced hostages to hold in the café window was beamed around Australia - with the country's Muslim community preparing for the inevitable backlash. When she awoke the next morning, Ezdihar Malas was so concerned about the risk that she asked her brother, Ahmed, 31, to accompany her on the train to work. This demonstrates the good will of the Australian public. We need more and more of such activities. Any event or activity that brings people together will be beneficial. "You have your god and your bad reactions, but you've always got to be prepared for your bad reactions," said Ezdihar Malas. "Thankfully nothing happened. There were no bad reactions. We didn't even get stared at." While on the train the pair told Al Jazeera they watched as a non-Muslim woman sat down next to a Muslim woman in a headscarf and seemed to offer her support. "It makes me feel proud to be Australian," said Ezdihar Malas. "I don't know how it is in other countries, but being in Sydney after something like this, seeing something like that makes your worries go away." When police conducted the biggest anti-terrorism raids in Australian history in Sydney and Brisbane in September, the backlash against the Muslim community was significant. In one case, a 60-year-old mosque in north Queensland state was vandalised when the word "evil" was graffitied across it. Elsewhere, Muslim women highly visible with their headscarves were targeted for harassment on the street and had their coverings pulled off. This time around, Australians have been quick to show their support for the country's Muslim community. Last night, as the siege wore on, mosques, synagogues, and churches around the country opened their doors to hold prayer meetings for the safety of the hostages. Many of these involved multiple denominations. Then Twitter sparked a solidarity campaign under the hashtag #Illridewithyou. The campaign started when Rachael Jacobs wrote on her Facebook about watching a Muslim woman remove her headscarf on a train to avoid any confrontation and the post went viral. Jacobs, a 37-year-old university lecturer from Brisbane, is currently declining media interviews, but told her story through Fairfax media. Since then, the hashtag has drawn both national and international attention that has served as an antidote to prejudice. But some such as the ultra-nationalist Australian Defence League (ADL) have still worked to try and use the siege as an example of "Islamic violence" in an attempt to stoke anti-Muslim sentiment. 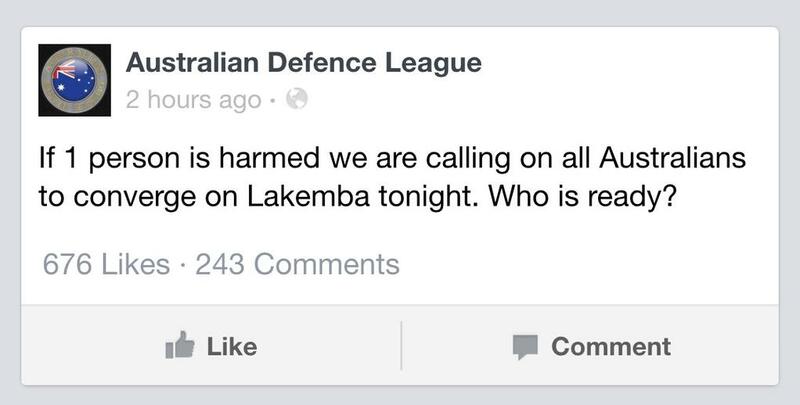 In one Facebook post during the siege, the ADL even appeared to incite violence by directing people to "converge" on Lakemba, a Muslim suburb of Sydney, should anyone have been hurt. The post has since been removed, but another YouTube video depicted an ADL member making Islamophobic remarks to bystanders near Martin Place in Sydney's business district who tried to challenge the ADL member. Still, such extreme responses have so far been limited, according to the Sydney-based Islamphobia Registry, a community organisation that aims to record and analyse instances of anti-Muslim sentiment. The organisation's founder, Marian Veiszadeh, praised the outpouring of support as "heart-warming", but told Al Jazeera all political questions can wait as thoughts should be with the victims and their families. "Given the emotion is so raw, particularly for the victims of the family, it's important to take a moment for reflection," said Veiszadeh. "We need to ensure adequate support for the victim's families and in time we will start asking the important questions like how this happened." This sentiment was shared by Samier Dandon, president of the Lebanese Muslim Association, who also said the thoughts of the Lebanese Muslim Association are with the victims, adding the #illridewithyou hashtag has served to bring people together at a difficult time. "This demonstrates the good will of the Australian public. We need more and more of such activities," said Dandon. "Any event or activity that brings people together will be beneficial." Kuranda Seyit, director of the Federation of Australian Islamic Relations, said the response so far shows the Australian public understands that what occurred were the actions of one man, and were not a reflection of the wider Muslim community. "The Twitter campaign really damped any negativity," said Seyit. "It really indicated the Australian public are more perceptive than we may otherwise give them credit … I really think we can differentiate between the crazies and the normal people." The atmosphere around Sydney was still tense Tuesday morning, with people in shock over the previous day's events. Hundreds ventured into the city to lay flowers for the victims at a makeshift memorial in Martin Place. A 38-year-old barrister, Katrina Dawson, and the 34-year-old cafe manager, Tori Johnson, were both killed during the siege with several others wounded in the confusion. Monis, 50, was also killed and it is believed that Johnson died after wrestling with Monis for his weapon when he became fatigued. Seyit also told Al Jazeera he had met Monis years earlier while doing community work among the Australian Muslim community. He described Monis as "intelligent" but "eccentric", and a "bit of a loose cannon" who indulged in conspiracy theories. Monis is largely considered to have existed on the fringe of Australia's Muslim community. A self-appointed sheik with a limited understanding of Islamic theology, Monis first came to notoriety after harassing the families of Australian soldiers killed in Afghanistan with letters. Then, a year ago Monis was charged as an accessory in the killing of his wife and released on bail. Mid-2014, Monis was again charged with 40 counts of sexual assault against several women, but was again released on bail. This has raised questions about how Monis' siege of the café could have occurred. For Australians, the attack is particularly shocking as gun violence of such a scale is rare given the strict gun control laws introduced following the Port Arthur massacre in Tasmania state in 1996, in which 35 people were gunned down. "The gun laws we were meant to have after the Port Arthur massacre are now watered down quite significantly," Samantha Lee, chairwoman of Gun Control Australia (GCA), was quoted as saying. "In the wake of the siege, GCA is calling on review of gun laws."